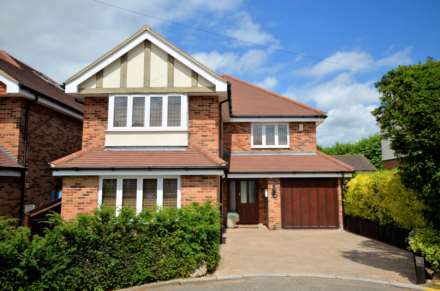 Being pleasantly positioned in a central prestigious Private Road, this aesthetically pleasing, five-bedroom detached home with two bathrooms and three En-suites, will give you both the space to live and the ultimate convenience of just a 60 second walk to the High Street - itself with the Mainline Railway Station serving London Liverpool Street at the north end. The generous Reception Hall provides a grand and impressive Entrance area, which then leads off to each of the ground floor rooms. The 17ft Lounge with contemporary `Hole-in-the-wall` design `nu-flame` gas fire controlled by a `Thermatronic Infra-red remote control` system, a Dining Room with a front facing bay window, a Study plus a stunning Kitchen/Breakfast Room with a light and bright glazed breakfast area with bi-fold doors leading out to the secluded garden. 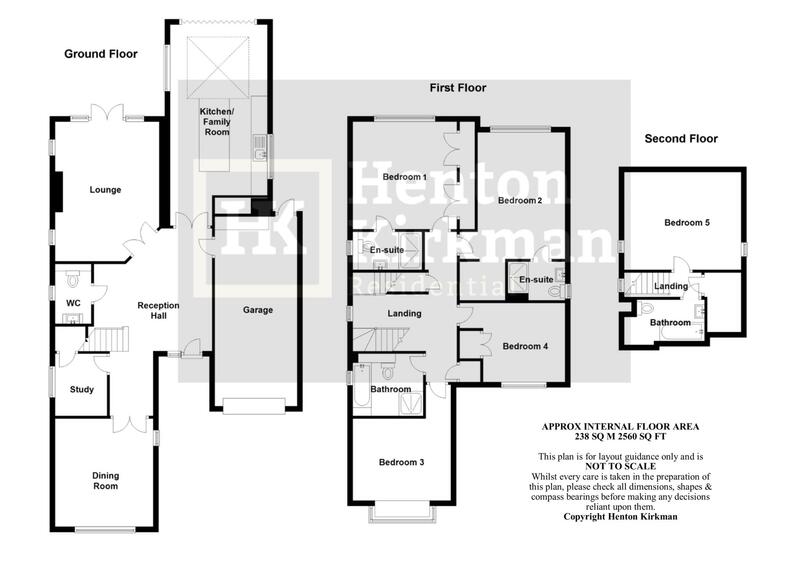 Upstairs, the five good sized bedrooms and four Bathroom/En-suites are spread nicely over the two top floors giving flexability to suit many family arrangements, with the top floor bedroom with skylight windows and en-suite also enjoying great storage courtesy of a large walk-in Store. Along with the balance of the remaining 10 year NHBC Warranty this premium home in a peaceful central position, also enjoys a secluded garden and a oversized integral garage with and electric up and over door. 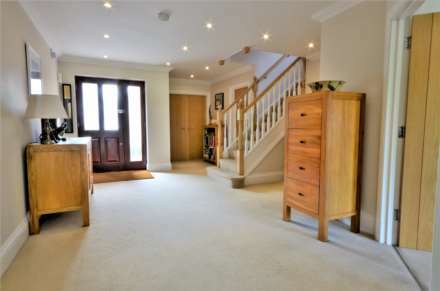 A recessed storm porch gives shelter and a quality hardwood stained Front Door with twin obscure glass panels adds to the great first impression of the home that this spacious and well-lit hallway, with underfloor heating, a large 4ft x 2ft full height Cloaks cupboard and recessed downlighters promotes. In addition, there is a lockable door to the garage, a softwood stained staircase finished with solid Ash handrails and newel posts, which together with internal doors of Oak veneer with inlay from `Vicaima" gives a very attractive and contemporary design. Fitted with a Villeroy Boch Basin from the elegant `Sentique` range with Hansgrohe mixer tap, over a wall mounted Vanity Unit with matching close coupled WC, natural Travertine tiles are to the floor and half wall height, downlighters are inset to the ceiling and a side window gives natural light. Accessed via Double doors from the hall, there are PVCu `lead lite` double glazed French Doors with adjacent full height windows each side opening out to the terrace this lounge with fitted surround sound also enjoys the warmth of underfloor heating. The room is further lit by two matching side facing windows either side of the Fireplace. itself a contemporary `Hole-in-the-wall` design of natural Portuguese Limestone with a `nu-flame` gas fire controlled by a `Thermatronic Infra-red remote control` system. 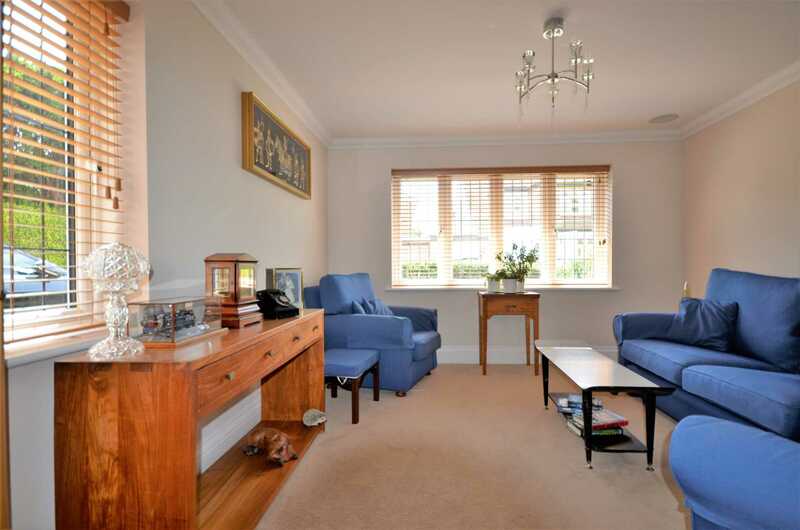 A pleasantly spacious dining room accessed via Double Doors from the hall with a large front facing `lead lite` white PVCu double glazed walk in bay window and further Side facing windows. 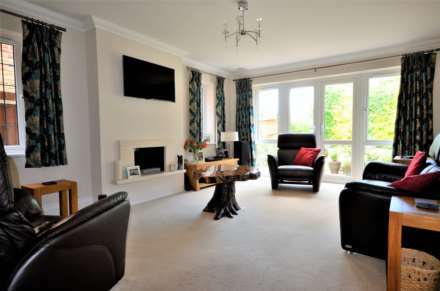 Again, there is a surround sound system and underfloor heating. 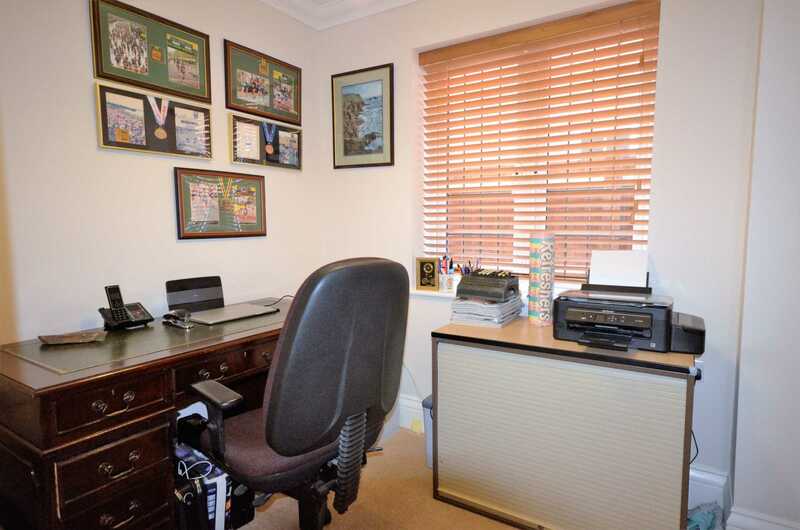 Positioned centrally in the house with a side facing window this study has a walk-in understairs storage cupboard providing great storage and also housing the OPUS Master Control unit for the home entertainment/multi room audio system. The kitchen is accessed from the hall via Double Doors. A 7ft wide opening is fitted with a set of bi-fold doors which fully open to bring the outside in, giving added impact to this stunning kitchen which again, has inset downlighting, a surround sound system and underfloor heating with Travertine effect ceramic floor tiles. The central feature Island unit incorporates a breakfast bar, Evoport pop-up electric sockets and a built-in 76cm Miele Touch Control Ceramic Hob with contemporary Falmec (euroline) 90cm `Polar` Island Extractor Hood over the top. ALL THE MAIN APPLIANCES ARE MIELE. Along with the hob, there is also a very smart looking 60cm Multi-Function Oven with 66L capacity (Miele model H4810B). 8 function Combi Micro-Oven (H5040BM) Plate Warming Drawer EGW5060. 60cm Built-in Larder Fridge, built-in Freezer. 60cm Fully Integrated Dishwasher. 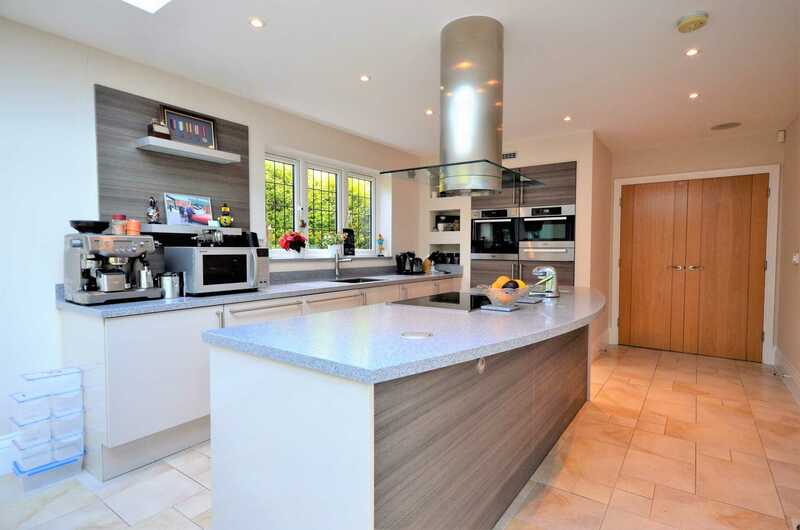 Plus, there is a Franke stainless steel Peak sink and Pilatus tap. 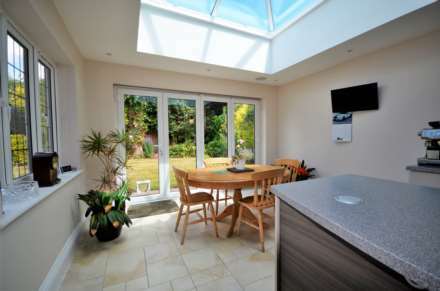 This area is designed to be used as a Breakfast Area/Morning Room and features a beautiful glass Lantern Rooflight. On the wall are a double electric socket and TV/Satellite sockets for a wall hung TV. 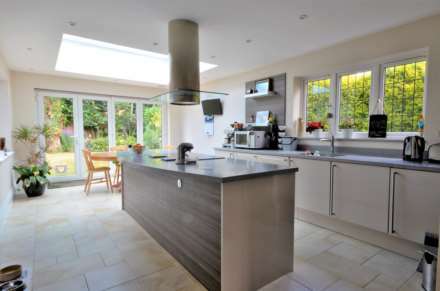 In addition to the Rooflight, extra light floods in to this area through a set of PVCu double glazed windows overlooking the garden, and by the further generous glazing provided by the afore mentioned folding doors which fully open allowing `the outside in` during the Summer months. Provided at the rear of the extra-long Garage. 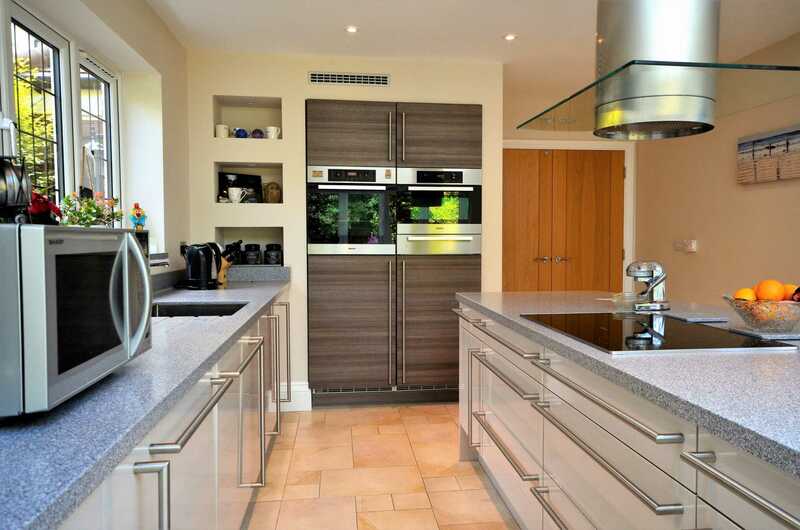 This includes a 500mm sink base unit, Impala laminated worktop and Franke Erica sink complete with Zurich tap. The feature return wood balustrade staircase from the hall continues up to the 2nd floor accommodation. 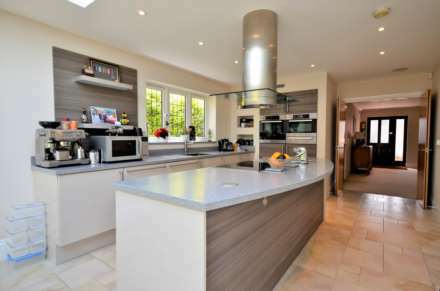 Within the landing area there is a side facing window, inset downlighting, a storage cupboard and airing cupboard housing the hot water cylinder. 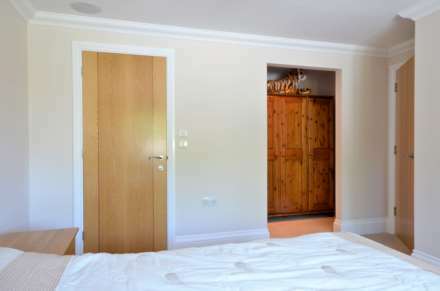 This rear facing bedroom has a built-in wardrobe along 11ft of one wall, with two sets of double doors providing great storage. There is also the surround sound system and an OPUS `input` socket for ipod etc. Its also worth noting there are TV/SATT/BT/Broadband sockets throughout.. There is a Villeroy Boch Basin from the elegant `Sentique` range with Hansgrohe mixer tap, over a high gloss white wall mounted Vanity Unit with matching close coupled WC and a 4ft 7 x 3ft fully tiled Shower with `Rainshower` head. 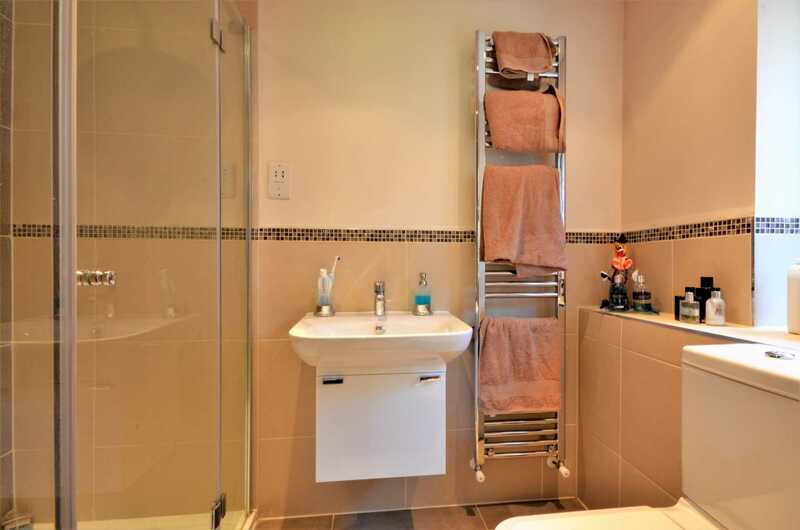 In addition, there is a shaver socket, extractor fan, a chrome heated tower rail. 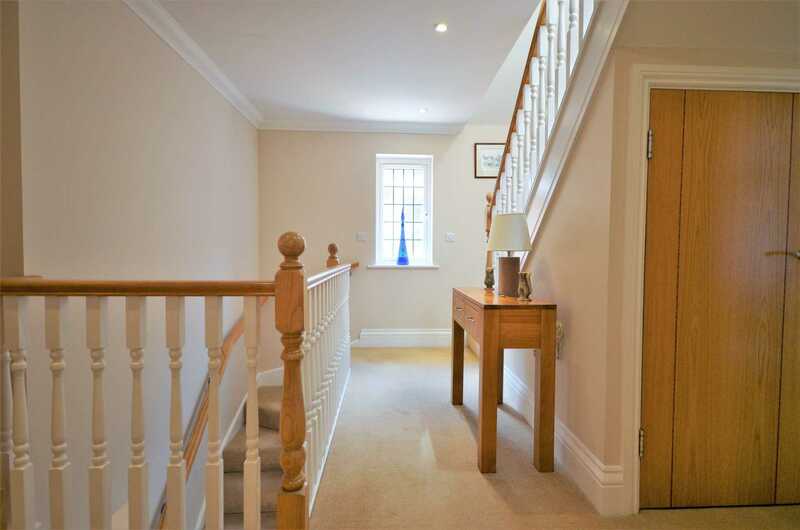 and attractive tiling to both the floor and half height of the walls. 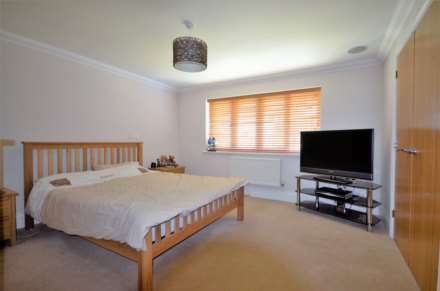 Another impressive rear facing bedroom suite which has the fitted surround sound system with an OPUS `input` socket for ipod etc. 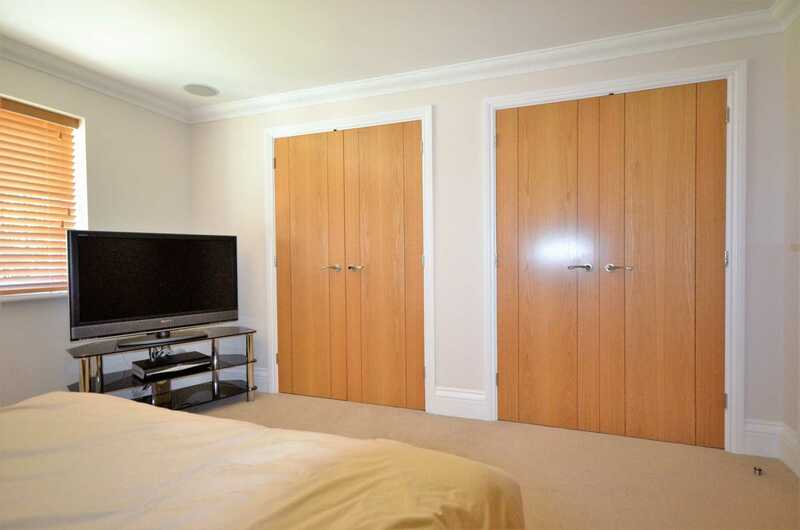 A recessed DRESSING AREA measuring 5ft 5" x 4ft 9" (1.65m x 1.45m`) with inset downlighting offers the potential for a walk-in wardrobe. Side facing white obscure window. Smooth finish to ceiling with inset downlighting. Stylishly fitted and with downlighting and a side window there is a Villeroy Boch Basin from the elegant `Sentique` range with Hansgrohe mixer tap, over a high gloss white wall mounted Vanity Unit with matching close coupled WC and a 4ft 7 x 3ft fully tiled Shower with `Rainshower` head. 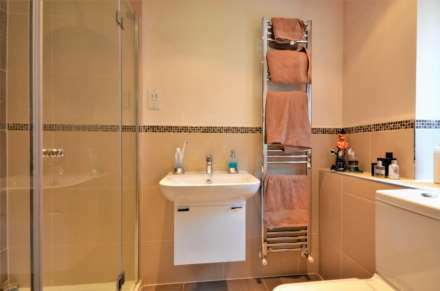 In addition, there is a shaver socket, extractor fan, a chrome heated tower rail. 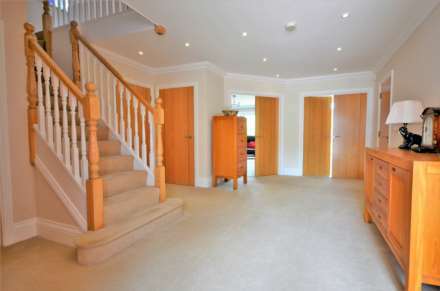 and attractive tiling to both floor and half height of the walls. A most pleasant front facing bedroom with a feature box bay window, a surround sound system and OPUS `input` socket for ipod etc. TV/FM Socket. Another double bedroom with a built-in double wardrobe and the surround sound system, with an `input` socket for ipod etc. 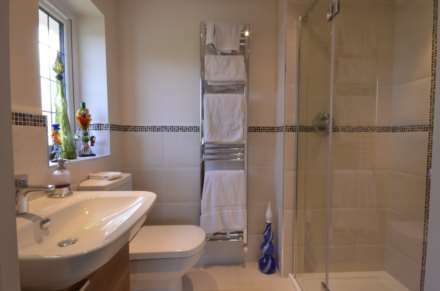 This part tiled family bathroom with a side window, inset downlighting and a tall chrome heated towel rail has a fitted white four-piece suite by Villeroy & Boch comprising an inset bath and separate 900mm x 900mm Shower Cubicle with Hansgrohe taps and shower valves, matching basin with Hansgrohe mixer tap, over a gloss white wall mounted Vanity Unit with matching close coupled WC. A skylight window floods natural light onto this landing, which has large walk-in Loft/Store Room of 9ft 1 x 4ft 2 (floor space). 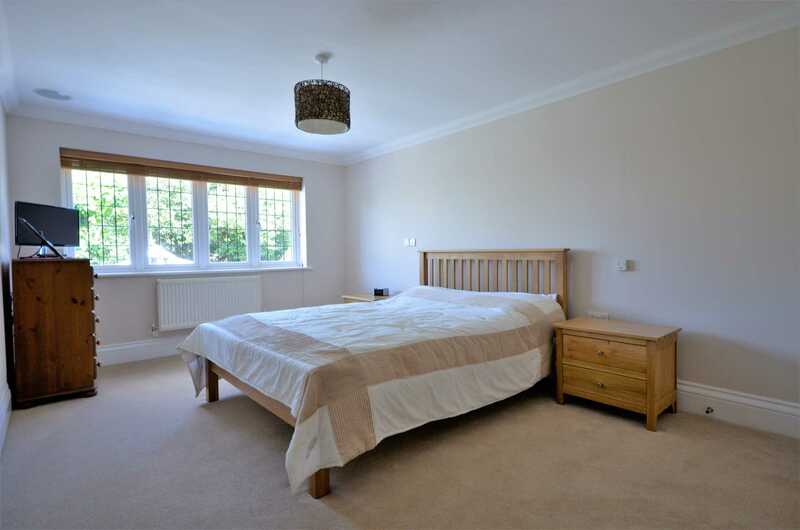 This lovely, Top Floor Bedroom has a side facing skylight windows, inset downlights and the surround sound system. Just like the other bathrooms this one is fully tiled and also has a Villeroy Boch suite, that comprises a semi pedestal basin with Hansgrohe mixer tap over, a panel bath with matching taps and a close coupled WC. 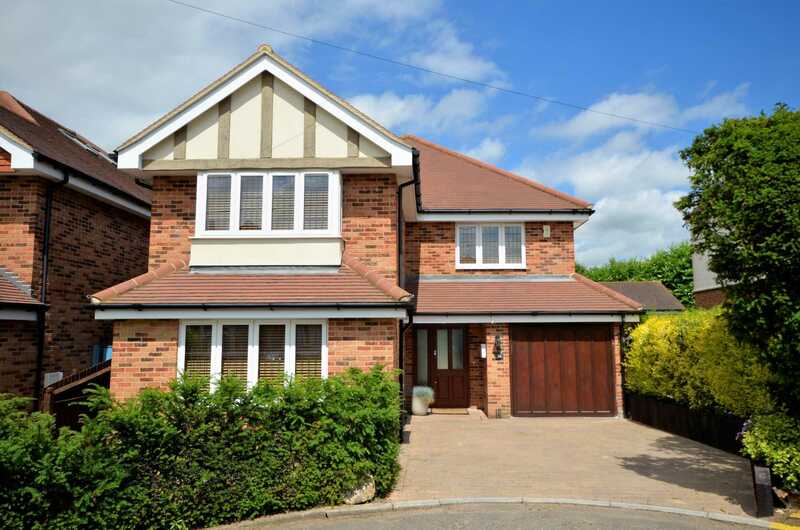 To the front of the house is a double width drive finished in Marshalls Tegula Block Paving and a lawn area with established planting to the front. 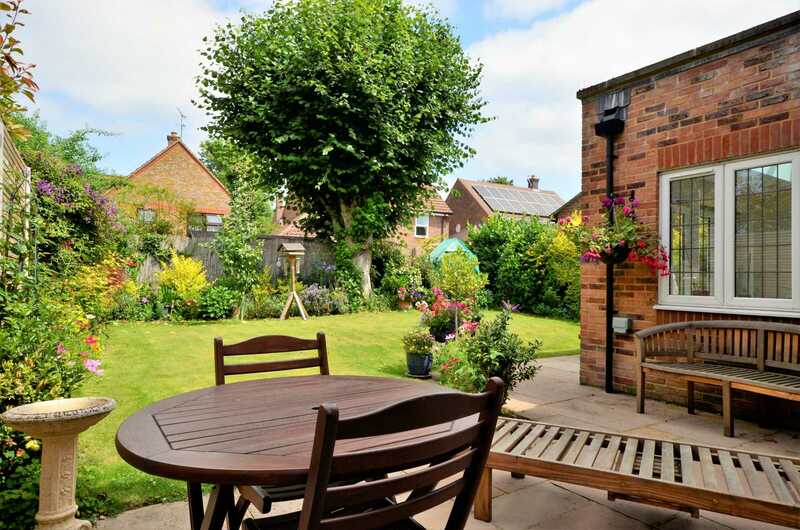 The rear garden is nicely secluded commencing with a paved Patio of Indian Sandstone, the remainder is mainly lawn. In addition, there is an external double electric power sockets and two outside `lantern` lights. An extra-long Garage measuring 7m (23ft) in depth has both a rear courtesy door and internal door from the hall. The electrically operated timber garage door comes complete with remote controls.